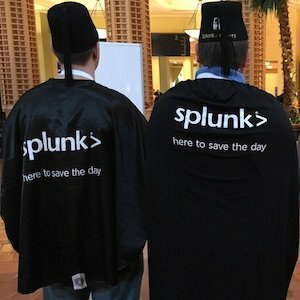 If you go to .conf, you may see a number of folks running around in capes with the slogan “Splunk> Here to Save the Day”. 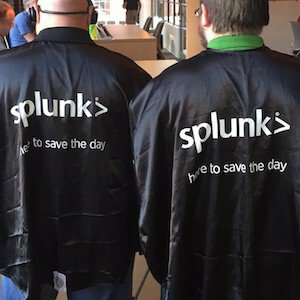 These are the original Splunk Capes… produced by Rachel Perkins to award and recognize awesome members of the IRC and Answers community long before the Splunk Trust was created. 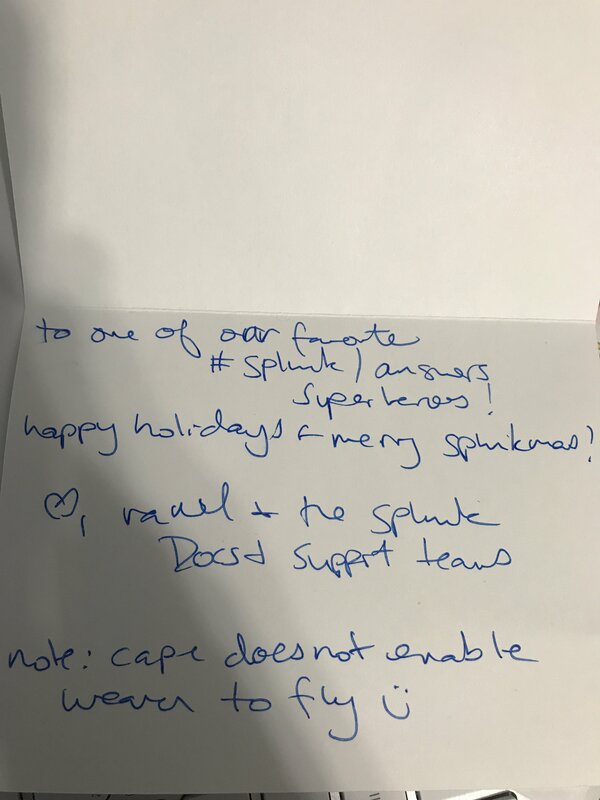 The original printing of the capes tie around the neck, and were mailed to community contributors sometime between Holidays 2012 to .conf2013, along with an enclosed card. At .conf2014, Clint Sharp was giving a segment of the keynote address around how Splunk can make you a superhero. As Clint is also an awesome member of the community, more capes were made and distributed (these ones happen to velcro around the neck and are a slightly different material) and an army of superheroes stood for the conclusion of his segment, to Clint’s surprise. Independent of these capes, Splunk Field Marketing in the Asia Pacific region made their own capes, albiet using the “Because Ninjas Are Too Busy”. slogan. 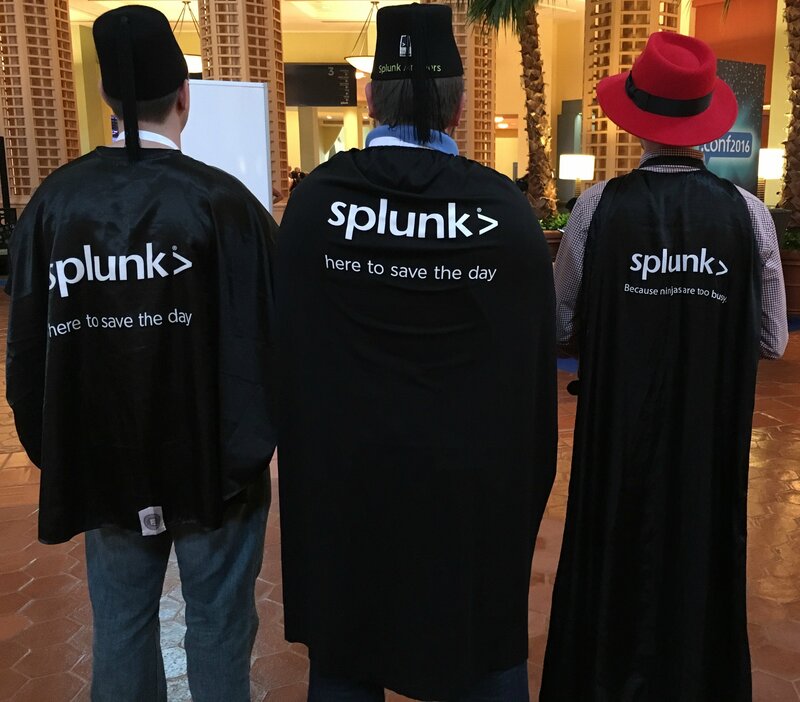 Others have made their own unofficial capes to show their Splunk fandom as well. [13:19:29] <cerby>    derkferz: I'm offended. My acts are always included. [13:19:49] <cerby>    should you choose to accept it. [13:20:03] <cerby>    Forget coffee mugs. 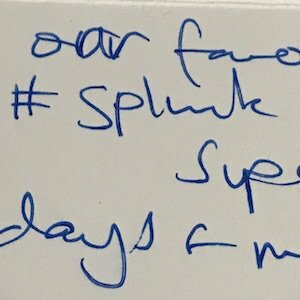 [13:20:28] <cerby>    Splunk> Yes, I am here to save the day. [13:20:32] <cerby>    Get on that. [13:20:35] <^Brian^>  cerby: the winnar is you! [13:20:36] <cerby>    I'll be your Splunk cape beta tester. [13:20:57] <madscient>        what better opportunity to bring back the "Splunk > IT Proctology"  tagline. [13:21:20] <cerby>    hexx - ahaha. thank you. that is awesome.